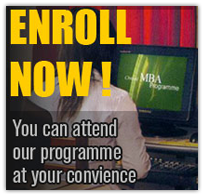 The MBA programme is offered in the English Language. The year is divided into 4 quarters. Three courses of four credit units each are offered in each quarter. To complete the MBA, the candidates must take 24 courses to obtain the required 96 credit units. Note: A project paper must be submitted, at the end of the courses, as the partial fulfillment of the requirement for the degree of Master of Business Administration.